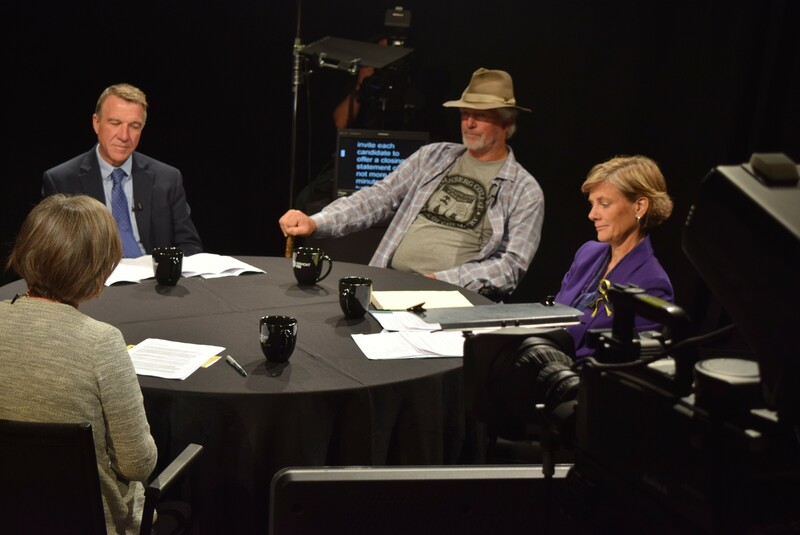 Gubernatorial candidates Phil Scott (left), Bill Lee and Sue Minter at a roundtable forum Monday with moderator Cathy Resmer. The government’s role in enhancing technology across the state proved a point of contention among the gubernatorial candidates during a debate Monday in Burlington. The tech-based roundtable discussion, part of Innovation Week in the Queen City, exposed that and other key differences between Democrat Sue Minter and Republican Phil Scott just weeks before Election Day. Scott countered that he won’t promise to bring universal broadband across Vermont. Both current Gov. Peter Shumlin and former governor Jim Douglas proclaimed they’d make such a vision a reality — but never saw it through. “I’m going to stop short of promising that,” Scott said, later calling for incentives to encourage private companies to expand broadband coverage. Liberty Union candidate Bill “Spaceman” Lee dismissed government’s role in bringing broadband and cell service to rural regions like his hometown of Craftsbury. 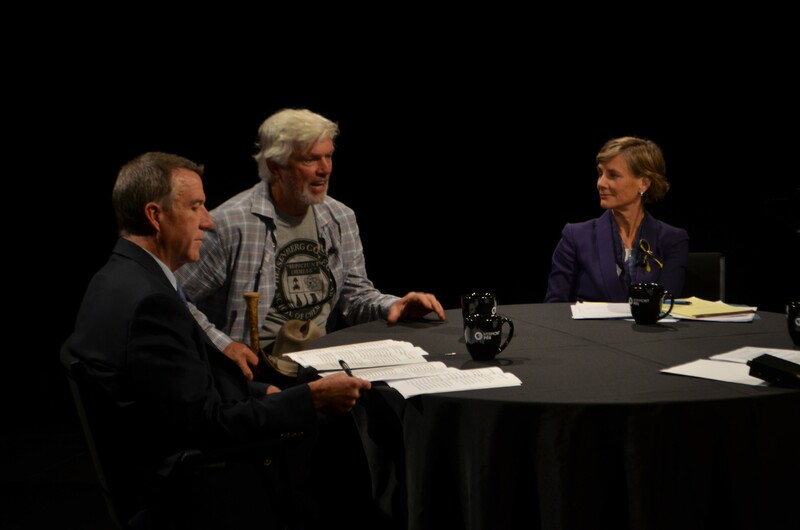 In the 90-minute forum moderated by Seven Days associate publisher Cathy Resmer and broadcast live on Vermont PBS television, Scott and Minter talked about how they have come to embrace technology in their everyday lives. Lee, meanwhile, said he eschews social media and doesn’t own a cellphone. Lee, who held a baseball bat throughout the event, said that even the Twitter account in his name is a fraud. “I get all my information at the general store and the library,” he said. The candidates consider a question. Minter and Scott both said they’ve seen technology change their jobs and their lives. Scott, who co-owns a Middlesex excavation company, said workers use computer technology to map out job sites. As a race car driver at Thunder Road in Barre, he said he’s constantly innovating to find ways to make car tires better grip the track. Minter, a former state transportation secretary, said that after Tropical Storm Irene hit Vermont in 2011, the agency used technology to do “instant permitting” during storm cleanup. Asked how they would prevent a repeat of costly problems that the state has encountered recently with installing new technology across various agencies, Scott and Minter offered different takes. Scott said the state should opt for more off-the-shelf technology instead of buying custom-made programs. When his excavation firm needed a new bookkeeping program, he was told it would cost $10,000 to $15,000. Instead, the company chose a $200 QuickBooks program, he said. Minter pledged to provide better supervision of technology contracts, saying she learned how to do that at the Agency of Transportation. She promised oversight every step of the way, from reviewing bids, managing the contractor during the project and then demanding results once the final product was in. The candidates also disagreed on how to help boost technology in Vermont schools. “Forcing from the top down doesn’t create anything but ill will,” Scott said. Minter countered that schools can’t be allowed to ignore technological advances and advocated for an emphasis in the science, technology, engineering and math fields — so-called STEM education. Such studies require technology that should be available to all students at school, Minter said. For instance, at Harwood Union High School, which her son attends, students use iPads, which open the door to new technology for families that wouldn’t be able to afford it on their own, she said. “I just worry about those who don’t have access,” she said. There were subtle differences, too, when the candidates were asked about state rules governing the classification of workers as either independent contractors or employees. The issue often affects website development companies that use outside experts for certain work. Scott said he supports legislation the House Commerce & Economic Development Committee passed this year that would have established new definitions for the use of independent contractors. The long-in-the-works bill passed 11-0 and was supported by business groups. But the legislation eventually died after fierce opposition from labor groups. Minter didn’t offer a firm assessment of the legislation but indicated that she thinks a compromise between the sides is possible. The issue will likely come up again during the next legislative session. Sen. Bernie Sanders (I-Vt.) will join state Democratic candidates for six rallies across the state this weekend. The events start Friday in Montpelier with a 7 p.m. rally (doors open at 5) at the Vermont College of Fine Arts Alumni Hall, according to Meg Polyte, the spokeswoman for Progressive/Democratic governor candidate David Zuckerman.